This is a big outlay for a large family but gives unprecedented views over Auckland and beyond, going up the tallest building in New Zealand (a grand 328 metres)! 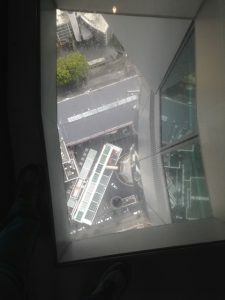 For some, their fear of heights might be challenged, whether it’s because the tower sways if it’s very windy or because there are reinforced glass panels that you can walk over on the viewing platform! There’s even a glass panel in the first lift that allows you to see the workings should you choose to look! The first lift takes you up to level 51 – the main observation level at 186 metres. Fully enclosed, with factual information at various points for children to complete a quiz about other tall buildings and statues in the world. You’ll then need to get into a different lift to reach level 60 – the Sky Deck, also fully enclosed and at 220 metres it’s the highest point you can go on the tower. During the school holidays, there are kids’ activities on both levels that are free to do. There’s a cafe on level 50 but it’s expensive and has a fairly limited choice of food and drinks on offer – you’d be better to eat before or after your visit. There are toilets with nappy changing facilities on the viewing platforms. Open: daily November – April 8.30am – 10.30pm (Sunday to Thursday with the last ticket sold at 10pm) and 11.30pm Friday and Saturday with the last ticket sold at 11pm. May – October daily 9am – 10pm with the last ticket sold at 9.30pm. Price: Adults $29, Kids (6-14years) $12, Kids 5 years and under FREE. Family Pass (2A+2K) $64, additional kids aged 6-14yrs $9.